Communities great and small across Europe for eight centuries have contracted with doctors. Physicians provided citizen care, helped govern, and often led in public life. 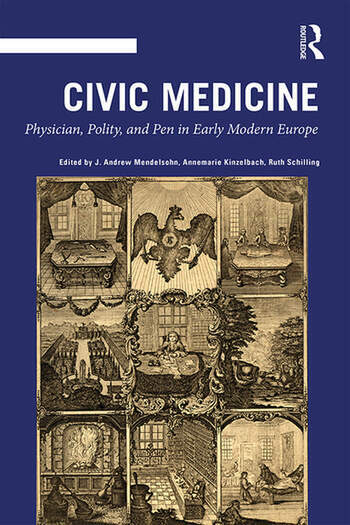 Civic Medicine stakes out this timely subject by focusing on its golden age, when cities rivaled territorial states in local and global Europe and when civic doctors were central to the rise of shared, organized written information about the human and natural world. This opens the prospect of a long history of knowledge and action shaped more by community and responsibility than market or state, exchange or power. J. Andrew Mendelsohn is Reader in History of Science and Medicine in the School of History at Queen Mary, University of London. Annemarie Kinzelbach has published extensively on medicine, health, and society in early modern Germany. She has been affiliated with the universities of Ulm, Berlin, Erlangen-Nürnberg, and Heidelberg. Ruth Schilling is Junior Professor for the History of Science at the University of Bremen and scientific coordinator of exhibitions and research at the German Maritime Museum.